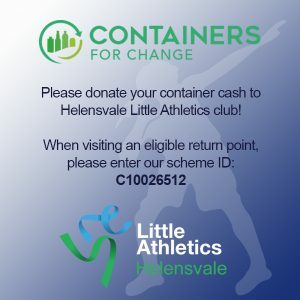 Little Athletics is a voluntary organisation, centres cannot operate without the assistance of parents each week in fulfilling the many and varied duties required. These include officiating at an event; managing an age group; recording results; working in the canteen; to name just a few. Most centres have parent assistance rosters. Additional assistance is always required on the centre committees and all parents are encouraged to become involved. Little Athletics is one of the few sports where parents can become fully involved in their child’s sporting interests. We understand that just like our athletes, our parents come from a diverse range of backgrounds and as such have different talents and experience. There is a place for everyone at Little Athletics and there are a number of ways that you can become involved. You may have skills that the centre doesn’t even know they need. So if you think you can help with something, let the committee know. Without parent support and help it is impossible for our club to run successfully and your children to have full engagement in the sport and the committee wishes to stress the importance of parents becoming involved in your children’s sport. Please don’t wait to be asked – Come forward and offer your assistance to help keep the centre running effectively! Setting up involves arriving early and putting out the equipment and age baskets for the day’s activities. To get started on time please offer your assistance on arrival to put out any equipment. As the events finish all parents should help put the equipment away. Each field event requires numerous helpers to ensure it’s successful running. This includes event chiefs, spikers, fetchers, recorders, rakers, bar lifters. Get involved – it is a great way to view your child’s performance up close. It has been proven that parents that get involved with their kids sport will give them the confidence and support to be their best.